If you've ever resented the fact that Taco Bell and KFC only offer delivery in certain places, then get ready for positive news: Both fast food giants have partnered with Grubhub to bring their offerings straight to your doorstep with new nationwide delivery. The partnership between Taco Bell, KFC, and Grubhub marks a big move for Yum Brands, the umbrella company that owns both restaurant chains. It's an endeavor that's been widely anticipated for years, with a delivery alliance between DoorDash and Taco Bell in 200 markets first surfacing in 2015. Now, though, T-Bell is taking KFC along for the ride, so expect a surge in late-night Double-Decker Tacos and KFC drumsticks deliveries across America. Yum is betting big on Grubhub to be its official delivery partner for the future, as upstart competitors like UberEats consume a greater slice of the delivery market. The fast-food juggernaut is investing $200 million in Grubhub to fund the expansion. Although the partnership has been announced, the delivery system hasn't been fully implemented across the nation's bevy of Taco Bells and KFCs. But you can expect a countrywide rollout to occur soon, according to a press release. "KFC, Taco Bell, and Grubhub will work with franchisees to test and roll out online ordering for pickup and delivery to thousands of participating KFC and Taco Bell restaurants in the U.S. markets Grubhub serves," the company said. "When the initial phase of this Grubhub partnership is launched over the coming months, KFC will offer door-to-door delivery of its freshly hand-prepared Original Recipe chicken and other menu items to consumers in the U.S. 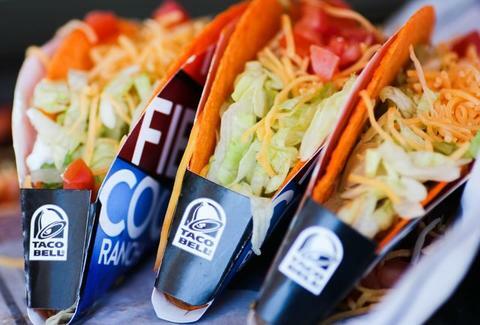 The partnership will help bring Taco Bell's innovative menu items like Doritos Locos Tacos and the signature Crunchwrap Supreme to more Taco Bell fans where, when and how they want it." It's a joyous time to be a couch potato -- especially one who lives for Taco Bell and KFC. Both brands have engaged in wacky and, dare we say, outrageous marketing tactics in recent months. But while you won't be able to order a Kit Kat Quesadilla or KFC-branded bath bomb to your home, it's clearly nigh time to binge order a plethora of $1 menu items.